John T. Fox, president and chief executive officer of Emory Healthcare, has been named chair-elect of the Board of Trustees for the Georgia Hospital Association (GHA). Fox accepted his post at the association’s annual convention in Atlanta earlier this month. He will succeed current GHA Chair Cindy Turner, president and CEO of Bacon County Hospital and Health System in Alma, Georgia. Since 1999, Fox has served as president and CEO of Emory Healthcare, Georgia’s largest and most comprehensive health care system. Emory Healthcare’s six hospitals and physician groups, together with Emory University School of Medicine, one of the Southeast’s leading academic medical centers, are transforming health and healing with a focus on the delivery of patient- and family-centered quality care. To achieve exceptional clinical outcomes, patient safety and service, Fox and the Emory Healthcare leadership team established a system-wide mission to improve quality and transform health care for its patients. In 2012, Emory Healthcare achieved its five-year goal of having its two large teaching hospitals rank in the top 10 nationally as measured under the University HealthSystem Consortium’s (UHC) Quality and Accountability Scorecard. In 2013, Emory Healthcare repeated this achievement with its two large teaching hospitals ranking #2 (Emory University Hospital, which includes Emory University Orthopaedics & Spine Hospital) and #3 (Emory University Hospital Midtown) in the UHC Quality Leadership Awards. Emory Healthcare is the only health care system to ever have two of its hospitals rank in the top 10 in this prestigious benchmarking database. 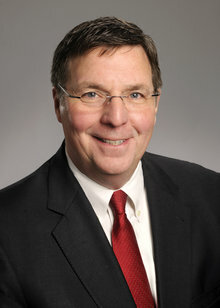 Prior to joining Emory Healthcare, Fox was executive vice president of Clarian Health (an academic medical center in Indianapolis) and vice president at the Johns Hopkins Hospital in Baltimore. Fox began his career as a CPA at Coopers and Lybrand, working extensively in health care consulting. He earned a bachelor’s degree in economics and history from Washington University (St. Louis) and has a master’s degree in business administration. "We are pleased to have John Fox as chair-elect of our Board," said Earl Rogers, president of GHA. "He is an outstanding leader with a strong dedication to improving health and educating the community about health care. We look forward to his service." Fox’s professional memberships include the American Association of Health Plans, the American College of Healthcare Executives, the Council of Teaching Hospitals and Health Systems Administrative Board, the Health Care Systems Governing Council of the American Hospital Association, the Healthcare Institute and the Atlanta Committee for Progress, among others. Fox will hold the position of chair-elect until the next annual meeting in Nov. 2014. Then he will be named chair of the GHA Board of Trustees, a position he will hold through Nov. 2015. Established in 1929, GHA is the state’s largest trade organization of hospitals and health systems providing education, research and risk management services to its 172 hospital and health system members. Additionally, it represents and advocates health policy issues benefiting Georgia’s citizens before the state legislature and U.S. Congress as well as before regulatory bodies. Emory Healthcare, with more than 16,000 employees, is the largest and most comprehensive health system in Georgia. In fiscal year 2013, Emory Healthcare had $2.6 billion in annual net revenue and provided $80.3 million in charity care. System-wide, it has 1,830 licensed patient beds.